If you have been following my product review posts under ‘Beauty’, you already know I am somewhat addicted to the Neal’s Yard Remedies Frankincense range. The key ingredient in this range is frankincense essential oil. 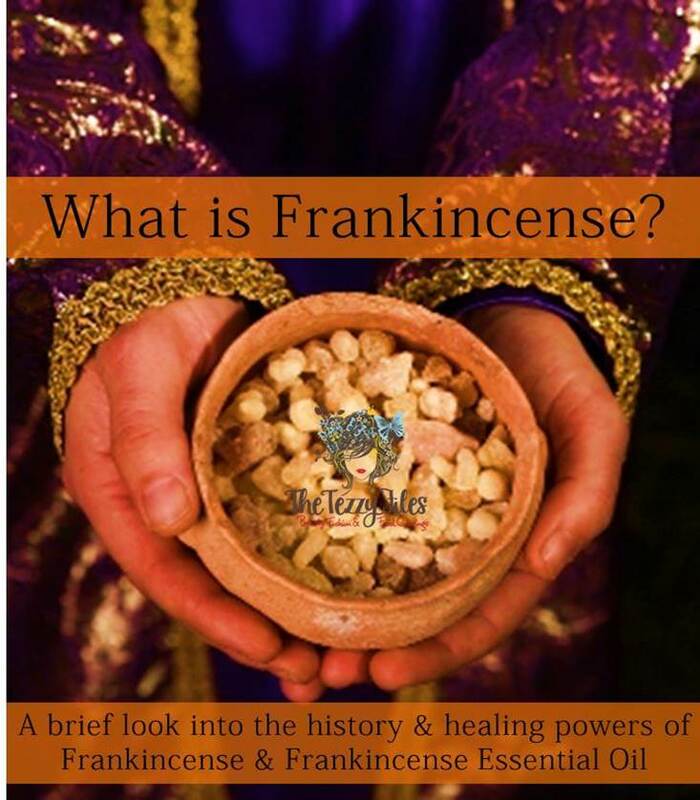 But what is Frankincense? And why has Neal’s Yard Remedies dedicated a whole range of skincare products to this age-old essential oil? Frankincense is an aromatic resin that is extracted from four different varieties of trees belonging to the Boswellia genus family. 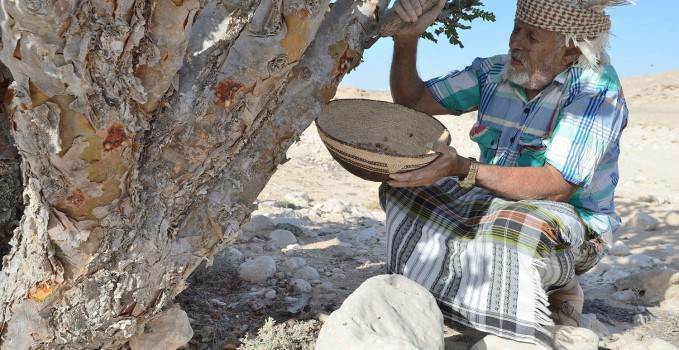 Boswellia trees grow in African and Arabian regions, including Yemen, Oman, Somalia, and Ethiopia. Oman is the best known and most ancient source of frankincense, where it’s been traded and shipped to other places like the Mediterranean, India, and China for thousands of years. The exact grade of frankincense is determined by the tree it comes from, and the time of year it has been harvested. Frankincense is edible, and has been a part of African and Indian traditional medicine for centuries. In Indian Ayurvedic medicine, frankincense is referred to as ‘dhoop’, and is extensively used to heal wounds, treat arthritis, strengthen the female hormonal system, and to purify the air. Frankincense is also linked to Christianity. It has several mentions in the Bible, and is believed to be one of the three precious gifts that the three wise men gave to baby Jesus. Frankincense is still burned as an incense in many churches across the world. Frankincense goes through a process of steam distillation to give Frankincense Essential Oil. 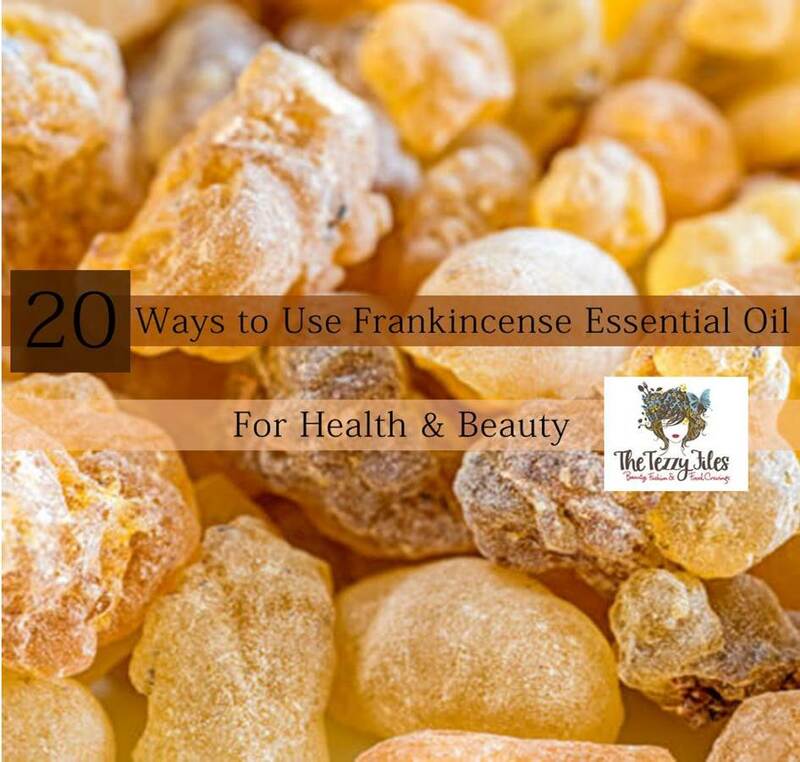 Healthy, Youthful Skin: Frankincense essential oil has been used extensively for skincare. It promotes healthy cell generation, is ideal for hydrating dry tired skin. Wrinkles: Frankincense essential oil is very hydrating, and helps battle premature aging. Fading scars: Frankincense essential oil aids in reducing the appearance of scars and stretch-marks. Apply a few drops on sun spots and freckles caused by overexposure to the sun. Doing this on a daily basis is a great way of fading them out. Removal of Warts: applying a few drops to a wart twice a day makes them disappear in no time. Oily Skin: Frankincense essential oil has sebum regulating properties that makes it ideal for rubbing into the oily T-zone of the face. Aromatherapy: Frankincense essential oil has a characteristic scent that can be likened to sweet basil with the strength of eucalyptus. Using it for aromatherapy is a great way to overcome stress. An Organic Scent: Frankincense essential oil can be worn as a perfume, and promotes a feeling of calm throughout the day. Strengthens Memory: Apply a few drops to the soles of the feet. Inhale a few drops in the cup of your hands. Rub in a few drops at the base of the neck. Doing so stimulates mental alertness and memory. Antiseptic: Frankincense essential oil has antiseptic qualities, and can be directly applied to wounds. Burning it in an oil burner is also a great way to disinfect a room. Strengthens Immunity: When inhaled via aromatherapy, frankincense essential oil strengthens the immune system. 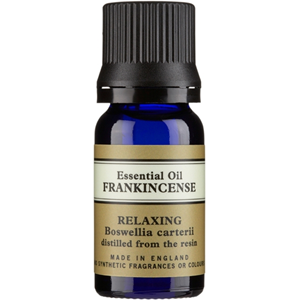 Pain relief: Frankincense essential oil has powerful pain relief properties. Rubbing a few drops on an injury provides almost immediate relief. Insect Bites: Alleviate the pain of an insect bite and reduce swelling with a few drops of frankincense essential oil. Arthritis: Rubbing in drops of frankincense essential oil greatly reduces arthritic pain. Improved Eyesight: Rubbing a few drops on the temple and around the eyes on a daily basis is believed to greatly improve eyesight. Stronger Nails: Rubbing a few drops on brittle nails greatly helps in making them stronger and healthier. Menstruation Woes: diluting a few drops into a warm bath can help to greatly alleviate heavy, painful periods and the onset of PMS. Healthy Gums: Frankincense essential oil has astringent properties, and rubbing a few drops onto the gums keeps them clean and healthy. Asthma Relief: Rubbing the essential oil on your chest is a good asthma remedy. Cancer Fighting Properties: Recent studies confirm that frankincense oil has powerful anti-cancer qualities. Use topically on the reflex points on the feet, or add a drop of frankincense to your drinks. You can also apply frankincense down the spine and base of neck. A Delicious Sip of Health: Add a drop to a glass of freshly made apple juice sweetened with honey to maintain overall good health. You can buy high-quality frankincense essential oil at your local Neal’s Yard Remedies store. Given all the magic frankincense essential oil can do for the skin and health in general, Neal’s Yard Remedies has an entire skincare range based on this amazing essential oil. 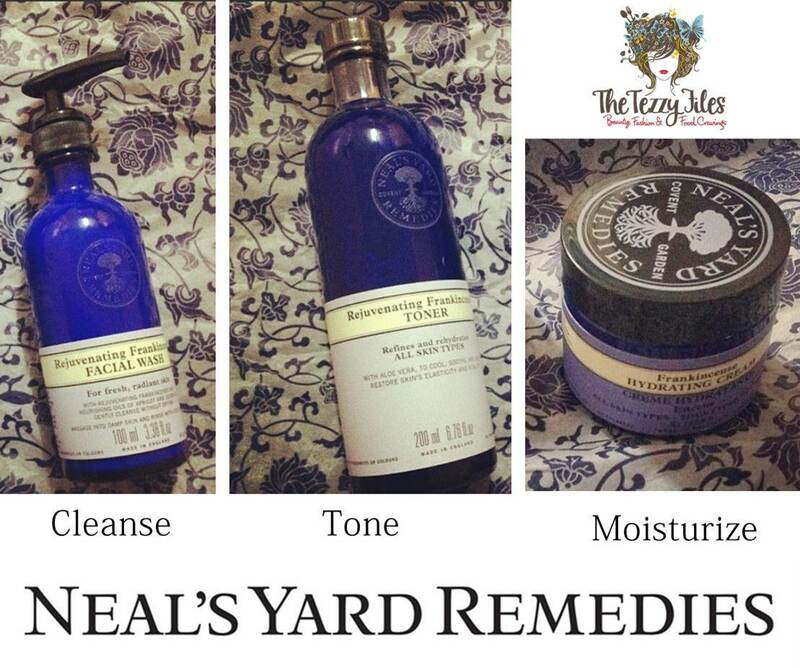 I have been doing the cleanse-tone-moisturize routine with Neal’s Yard Remedies’ Frankincense range for the past month, and love how soothing these products have been on my skin. The products have a subtle scent of frankincense, and are loaded with skin-loving organic ingredients. This is a very gentle cleanser. It does not lather very much, and the texture is light and fluid. Having said that, it is creamy and leaves the face looking and feeling fresh, clean and visibly vibrant. I love the scent of this facial wash; it is an aromatic treat every time I wash my face. The key ingredients of this product are frankincense, apricot and jojoba oil. It is therefore no wonder that the skin feels hydrated after a wash as opposed to the tight drying feeling many commercial face washes tend to give. It comes in a handy pump bottle, and the only downside is that the bottle is made of glass. I believe this is to preserve the lifespan of the organic ingredients. The dark blue looks gorgeous on my bathroom shelf, and I need to ensure it is well out of reach from little hands. Neal’s Yard Remedies Rejuvenating Frankincense Wash retails for AED 140 for a 100ml bottle, and is available at all NYR stores nationwide. I love this toner! A quick sweep of this on a cotton ball all over my face feels deliciously cooling, and the scent accentuates the experience of the wash.
Apart from frankincense essential oil, the toner is also loaded with Aloe Vera to refresh, rehydrate and improve the elasticity of the skin. Again, like the wash, the toner comes in a glass bottle and needs special care. Given it is a bigger 200ml bottle, I can envision recycling it into a pretty vase after its all used up! Neal’s Yard Remedies Rejuvenating Frankincense Toner retails for AED 165 for a 200ml bottle, and is available at all NYR stores nationwide. This cream is a godsend for dry, parched skin. It is beautifully rich and creamy, and has a concentrated scent of frankincense. 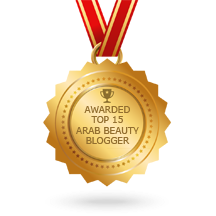 Using this cream in the morning keeps my skin supple and hydrated all day long. Apart from frankincense, the cream is also loaded with myrrh and together they form a powerful combination to combat the early signs of aging. Neal’s Yard Remedies Frankincense Hydrating Cream retails for AED 205 for a 50 gram jar, and is available at all NYR stores nationwide. Posted in Health & Wellness, Product Reviews and tagged abu dhabi, Beauty, beauty tips, dubai, essential oil, frankincense, organic beauty, sharjah, UAE. Bookmark the permalink. Thank you for this. I’ve been really interested in this range but wasn’t sure if it’s worth the splurge.. I am glad I found you, your reviews are so detailed!